Stan Lee never really recaptured the writing magic that he harnessed so profitably in the 60’s. Some would argue that that’s because masters like Ditko and Kirby were carrying the freight in the respective writer/artist teams, and others would contend that times and tastes changed. 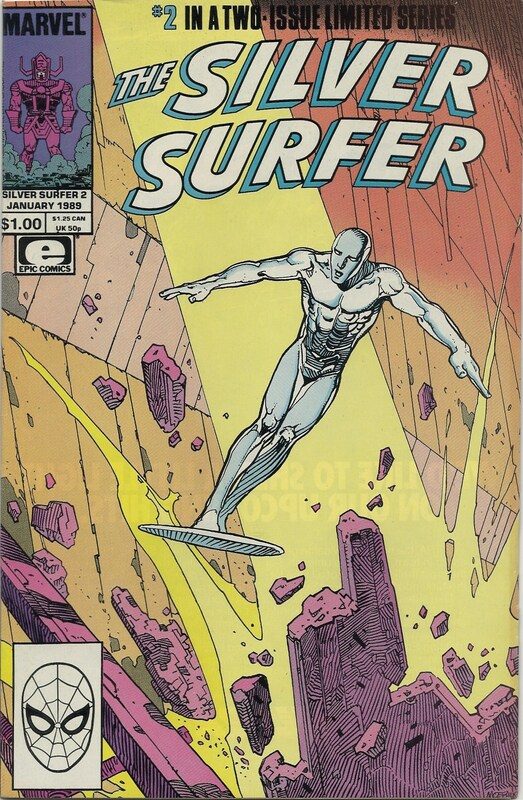 But Lee has always said that the Silver Surfer is his favorite character, and maybe it was that select status that helped rouse him to put together a pretty nice little story in collaboration with Jean (Moebius) Giraud. These two-issues re-imagine the coming of Galactus as the true biblical apocolypse that it should be, complete with raving lunatics and end-of-times hysteria. Moebius employs his elegant artwork to maximum effect as the religious themes are hammered home and the Silver Surfer as messiah challenges Galactus’ evil godhood. Fun stuff, and Lee summoned his A-game to match the beautiful visuals. 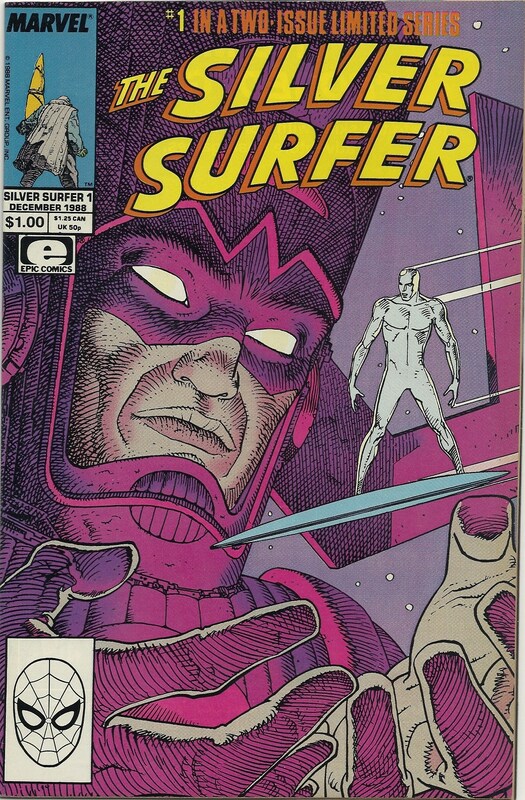 I’ll never say a negative word about Kirby — well, I might offer a criticism here and there — but as far as the Surfer goes, I kind of like Moebius’ version. He gives him less of a blocky physique, making him more lithe and agile looking (handy when you’re dodging Galactus’ energy blasts). He renders him more as a swimmer and less as a linebacker, and I think that’s a good and appropriate thing. Hahahaha, that audio clip is hilarious, thanks for uploading! I had this story for a while before I got around to reading it, mainly because I feared how Lee’s writing would fare and was surprised at how excellent it is. I can’t disagree, though I might add Ron Lim to the debate. How odd; I just reread this recently and was going to write a review for my own site as well. Ron Lim is THE Silver Surfer artist, as far as I’m concerned, as he was the Silver Surfer artist of my youth, and I always loved the way his Surfer was just so shiny. But I do think Moebius was able to capture the loneliness and alien-ness of the Surfer in a way that no one else has been able to – including Kirby. Great clip thanks! Loved that scene. Even if they forgot Busecema. But, in a sense, Buscema was portraying Kirby’s Surfer. Also like Ribic’s Surfer in Requiem. All of the vol. 4 series from 2004 is outstanding as well, story and art.